Elaborate analogies between Irish and Jewish history, between Irish and Jewish subjectivities, occur with surprising frequency throughout American literature. They recall James Joyce's Leopold Bloom and episodes of Ulysses, Douglas Hyde's analogies during the Celtic Revival between learning Hebrew and learning Irish, and a myriad of claims of an unusual relationship between these peoples that goes… beyond comparisons of their respective diasporic histories. But how does one describe this uncanny relationship, one often marked by hostility, affinity, and ambivalence, without essentializing people whose origins, class affiliation, educations, life experiences, and so on are enormously different? "e;Something Dreadful and Grand"e;: American Literature and the Irish-Jewish Unconscious describes a complex allosemitism and allohibernianism through a variety of cultural texts with which immigrant Irish and Jewish Americans were most engaged: popular music of the Tin Pan Alley era, tenement literature from Anzia Yezierska and James T. Farrell through the posthumous publication of Henry Roth's An American Type, and proletarian and socialist-inflected drama by Elmer Rice, Clifford Odets, Eugene O'Neill, and Arthur Miller as they engaged the Irish drama of such writers as Bernard Shaw and Sean O'Casey. In an effort to trace both the genealogy and more recent trajectory of immigrant drama and fiction, chapters explore both the post-Famine melodramatic stage of the nineteenth century and a host of more contemporary texts from newer generations of immigrants. Throughout, the book argues for a "e;circum-North Atlantic"e; culture in which texts from Ireland, Britain, Irish America, and Jewish America contribute substantially to both a modern American literature and to understandings of the terms "e;Irish"e; and "e;Jewish. "e;How can we really know what these terms mean as they delimit or erase totally the differences inherent to them? 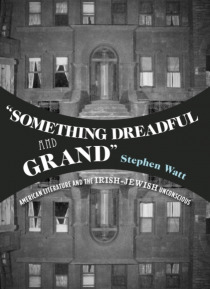 Borrowing a term from psychoanalytic and political theory, "e;Something Dreadful and Grand"e; explores the larger dimensions of this Irish-Jewish unconscious underlying cultural production in America, arguing for the centrality of these two diasporic groups to the development of American popular music, fiction, and especially drama.